11 November 2017, Thimphu: As COP23 international climate talks continue in Bonn, Bhutan has launched a ground-breaking US$13.9 million Global Environment Facility project aimed at enhancing the resilience of communities and protecting the country’s unique and rich biodiversity in the face of a changing climate. The UNDP-supported 'Enhancing Sustainability and Climate Resilience of Forest and Agriculture Landscape and Community Livelihoods in Bhutan’ will be implemented over six years. Covering 12 dzongkhags, 38 gewogs, four biological corridors and three protected areas, the project is Bhutan’s first integrated initiative, designed to support the interconnected Sustainable Development Goals (SDGs) of Life on Land (SDG15), Climate Action (SDG13) and No Poverty (SDG1). Launching the project in the presence of the Minister for Agriculture and Forests, Lyonpo Yeshey Dorji and the Minister for Works and Human Settlement, Lyonpo Dorji Choden, CEO and Chairperson for the Global Environment Facility (GEF), Ms. Naoko Ishii, remarked on the leadership of Bhutan in environmental conservation. The new project is funded with $US1.1 million from the GEF Trust Fund for Sustainable Forest Management incentive fund, $2.3 million from thw GEF Trust Fund for Biodiversity and Land Degradation Focal Area, and $10.5 million from the GEF Least Developed Countries Fund. The launch of the UNDP-supported project coincides with the launch of the Royal Government’s Bhutan for Life, an innovative, multi-partner funding initiative developed with the World Wildlife Fund (WWF) that aims to provide a sustained flow of finance to maintain Bhutan’s protected areas and biological corridors for perpetuity. US$2.2m from the UNDP-supported project will contribute to the conservation milestones of Bhutan for Life, focusing on operationalizing four of Bhutan’s eight biological corridors through climate-adaptive conservation plans, improved governance, and improving the lives of people who live in or around the corridors and adjoining protected parks. UNDP has been working with the Royal Government and people of Bhutan since 1973 to reduce inequality, build resilience and empower the disadvantaged to achieve Gross National Happiness and the Sustainable Development Goals. This project’s formulation began in 2016, building on the results of two previous UNDP-supported projects under Bhutan’s National Adaptation Plan of Action (NAPA). The first, reducing risks associated with Glacial Lake Outburst Floods - historically lowering the perilous Thorthormi lake - the second, focusing on landslide management, flood prevention, disaster risk reduction and management, to manage forest and agricultural landscapes for enhanced climate resilience. 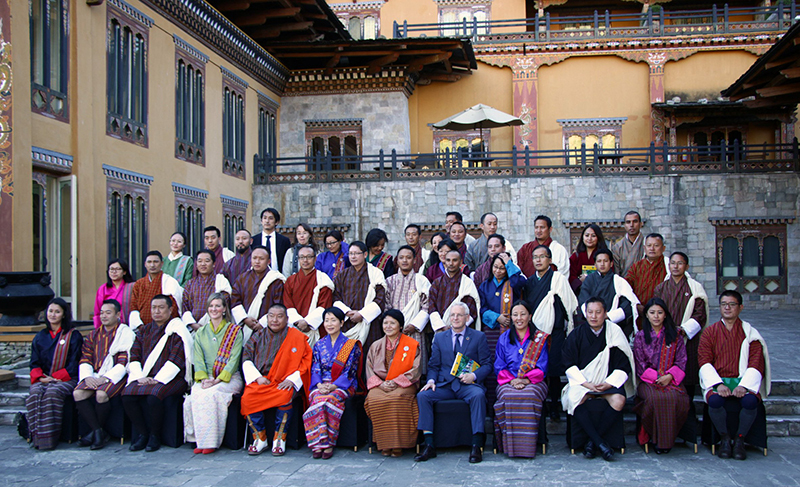 In 2006, Bhutan was one of the first Least Developed Countries to prepare its NAPA, which provides a process for Least Developed Countries to identify urgent and immediate climate change adaptation needs.